6sqft’s series “Where I Work” takes us into the studios, offices, and off-beat workspaces of New Yorkers across the city. In this installment, we’re touring high-end interior hammock company Pouch‘s Bushwick studio.Want to see your business featured here? Get in touch! Working with a group of artisans in El Salvador who employ a traditional Salvadoran weaving technique and a fellow Bushwick company that naturally dyes all the cotton (using materials like tree bark and avocado pits), Robert has taken his family’s roots and brought them to what is arguably the maker capital of the country. 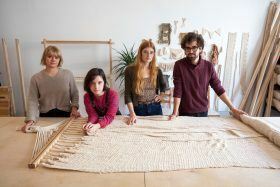 6sqft recently visited Pouch’s Brooklyn studio to learn more about the company and see how the hammocks are made, step-by-step. 6sqft’s series “Where I Work” takes us into the studios, offices, and off-beat workspaces of New Yorkers across the city. 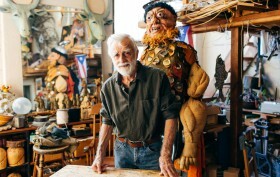 In this installment, we’re touring artistic duo Strosberg Mandel‘s Soho studio.Want to see your business featured here? Get in touch! Last year, Belgian-American figurative painter Serge Strosberg had an exhibit about feminism in the East Village. The show’s curator introduced him to David Mandel, a theatrical stylist, jewelry designer, and former drag queen. Though the two came from very different artistic backgrounds, they immediately hit it off on both a personal and professional level. 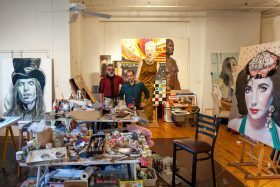 Fast forward to today, and they’ve formed the NYC-based artistic duo Strosberg Mandel, creating large-scale assemblage portraits–mostly of rock n’ roll icons such as Prince, David Bowie, Elvis, and Cher–using found materials and glamorous add-ons like Swarovski diamonds and luxury fabrics. In anticipation of their upcoming debut solo exhibition “Troubadours of Eternity” at Lichtundfire from January 24th to February 4th, in which they’ll unveil the full portrait series as “a celebration of authentic musicianship and timeless spirits,” Serge and David invited us into their Soho studio to get an advanced preview of the pieces and learn about their unique work and partnership. 6sqft’s series “Where I Work” takes us into the studios, offices, and off-beat workspaces of New Yorkers across the city. In this installment, we’re touring Glaser’s Bake Shop, a 115-year-old German bakery in Yorkville.Want to see your business featured here? Get in touch! In the early 20th century, New York’s German immigrants relocated from the East Village to the Upper East Side neighborhood of Yorkville, which soon became known as Germantown. The community was so culturally rich, that German was spoken more than English in this area. 86th Street was dubbed “Sauerkraut Boulevard” and was lined with German butchers, restaurants, and bakeries. After the dismantling of the Second and Third Avenue elevatrated trains in the 1940s and ’50s, most of the German community moved out, but several of these old-time businesses still remain, one of which is Glaser’s Bake Shop. When German immigrant John Glaser opened his bakery in 1902, there were half a dozen nearby competitors. 115 years later, the perfectly preserved storefront on First Avenue and 87th Street is the last of its kind in Yorkville, but it’s still filled everyday with new neighbors and long-time residents alike, eager to satisfy their sweet tooths with the extra chocolately brownies, jelly donuts, Bavarian pastries, and their famous black-and-white cookies. Glaser’s is now owned by John’s grandsons Herbert and John, who are committed to keeping their family’s traditions alive. 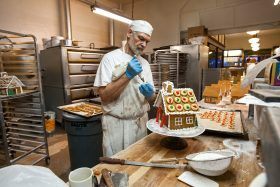 6sqft recently stopped by to watch Herb work on massive gingerbread village and chat with him more about the baker’s history and how he’s seen Yorkville change over the years. 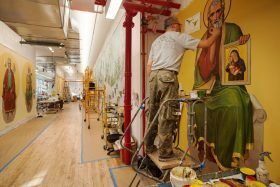 In anticipation of Jeff’s recognition, 6sqft was given a behind-the-scenes tour of EverGreene’s new office and studios in Industry City, where the firm’s master artisans were hard at work painting murals, casting plaster moldings, and researching the history of several upcoming projects. We also spoke with Jeff himself about what inspired him to get into the field (“I ate the crayons before marking the walls,” he says), how preservation has changed since he started the firm in 1978, and what some of his favorite projects have been. 6sqft’s series “Where I Work” takes us into the studios, offices, and off-beat workspaces of New Yorkers across the city. In this installment, we take a tour of the Bed-Stuy urban farm Square Roots. Want to see your business featured here? Get in touch! 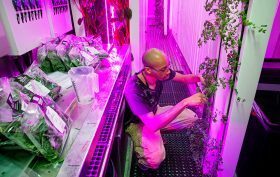 In a Bed-Stuy parking lot, across from the Marcy Houses (you’ll know this as Jay-Z’s childhood home) and behind the hulking Pfizer Building, is an urban farming accelerator that’s collectively producing the equivalent of a 20-acre farm. An assuming eye may see merely a collection of 10 shipping containers, but inside each of these is a hydroponic, climate-controlled farm growing GMO-free, spray-free, greens–“real food,” as Square Roots calls it. The incubator opened just this past November, a response by co-founders Kimbal Musk (Yes, Elon‘s brother) and Tobias Peggs against the industrial food system as a way to bring local food to urban settings. Each vertical farm is run by its own entrepreneur who runs his or her own sustainable business, selling directly to consumers. 6sqft recently visited Square Roots, went inside entrepreneur Paul Philpott‘s farm, and chatted with Tobias about the evolution of the company, its larger goals, and how food culture is changing. 6sqft’s series “Where I Work” takes us into the studios, offices, and off-beat workspaces of New Yorkers across the city. In this installment, we take a tour of the Gowanus studio of Lite Brite Neon. Want to see your business featured here? Get in touch! Among the manufacturing and arts tenants in the Old American Can Factory, a converted six-building industrial complex at the Gowanus Canal, is Lite Brite Neon, which has been described as “the darling of artists and designers.” And after touring their funky workspace/showroom, the description definitely fits. 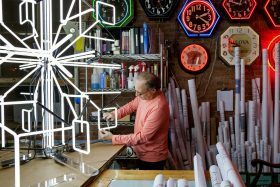 They were founded in 1999 in Brooklyn and have been creating neon art, signage, lighting, and displays ever since, in addition to preserving and restoring historic neon. 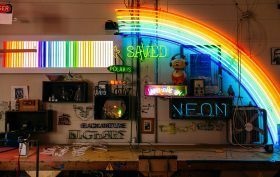 6sqft recently got an insider’s look at their colorfully gritty home and spoke to lead designer Wayne Heller about how the company functions and what makes neon unique. 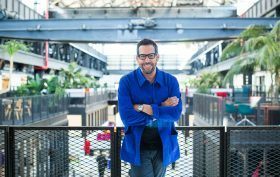 In this 6sqft feature, we speak to New Lab’s co-founder and Macro Sea Executive Director and founder David Belt. David is also the founder and Managing Partner of DBI, which is currently managing the realization of the Performing Arts Center at the World Trade Center, amongst other high-profile projects around the city. Ahead, he takes us through the new facility and gives us some intel on what inspired the design, the cutting edge companies that have taken up space, and what he ultimately hopes to achieve with New Lab.